Enriched Air diving, commonly referred to as "Nitrox" diving has gained popularity among California divers over the past several years. 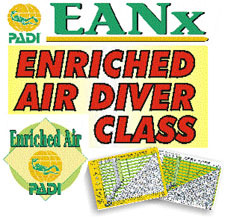 Diving with enriched air Nitrox lets you safely extend your no stop time beyond the no decompression limits for air. Diving with enriched air means more time underwater – but you need to be certified as an Enriched Air Diver to get enriched air fills. PACIFIC WILDERNESS offers two Options to complete this Course; On Line / In Store Combo or an All In Store Option - Price is the same. Either way, we can teach you how to safely dive on enriched air, with only 4-5 hours of class time & 2 Optional Nitrox dives. **Full SCUBA Gear is available for Rental at a Package Rate of $40. Complete Class Sessions and Complete All Assignments. Demonstrate Knowledge of Enriched Air Usage & Use of Tables. Our most Popular NITROX Program. This Specialty NITROX program incorporates about 2 to 3 hours of Online Instruction through the PADI e-Learning Program. If you choose this program, you may simply Register online with PADI using the Link below - Naming Pacific Wilderness as your shop. Pay the Online Course fee of $195 and complete the work. Once you've completed the Online portion, you will receive a "Proof of Completion" and we will be notified. Following completion, we can arrange "Session #2" to complete your Course. If you choose, you can book Two Optional Supervised Nitrox Dives to enhance your Specialty Certification. For Us "Older Folk" it's a Safer Gas than Air as long as you stay within the maximum Depths. This allows us to dive the same profiles, but stay well within Deco Limits. It allows those with Difficult or Varying Work Schedules to take Specialty Classes at their own pace & schedule. Click the Link Below to Begin your PADI Nitrox Course On Line. Unlimited Access to the Nitrox Materials Online. Review Session at our San Pedro Store. Our most Popular Specialty Program. The Specialty NITROX program incorporates about 5 to 15 hours of Instruction Customized to your Schedule. Simply come in and register for the program. We'll give you your Books, DVD, Tables and review the requirements. Complete the Book at your own pace and then attend two class sessions to complete the course. Session #1 (On Line or In Store): - Dedicate 2-3 Hours total time. This may be done On Line at your own Pace or in One evening at the store. Session #2 (In Store): - Dedicate about 2 Hours total time. This may be done in One evening. Session #3 (Optional Dives) - You will need to Dedicate a Half Day. Our Beach Dives are normally arranged early morning when conditions are typically best. Session normally runs 7 am to Noon. If you opt for the Boat Option, the day will run from 6:45 am till about 5:00 pm and there will be an additional charge for the Boat Trip itself. If you need help or have any questions on how to schedule Your NITROX Class Please call or e-mail us and well be happy to walk you through it!